The single floor and adjoining bungalows are spread over the park. The accommodations are all comfortable and furnished with care, and equipped with a DVD player and wireless internet (for a fee). You have the choice of various types, namely a 4+2 pers. (NL-3775-04, suitable for 4 adults and 2 children) and 4 person types (NL-3775-05, equipped with bunk beds, and NL-3775-06. This variant is more spacious and has only single beds). You also have the choice of a 2 person. type (NL-3775-09) and a 4-pers. 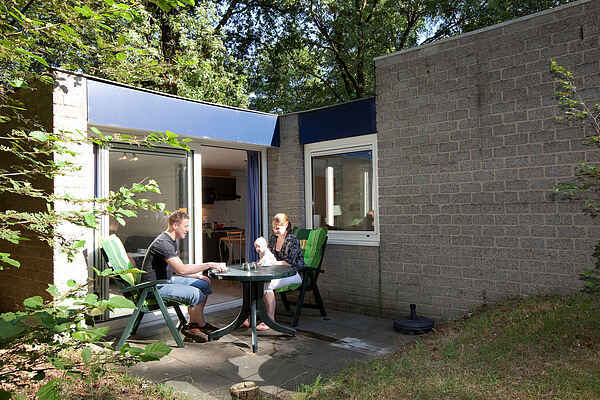 type (NL-3775-10), this 4pers accommodation has a room specially equipped as a baby room. Incidentally, there is a child-friendly type (NL-3775-11) for 4. persons, this accommodation is equipped with a cot, high chair and box, changing mat and bouncer. One of the bedrooms is equipped with a children's bunk bed and children's toys. Finally, you can still choose from a luxury 6 person. bungalow with sauna (NL-3775-12). Each bungalow has its own terrace with garden furniture and plenty of privacy.